Last week was a great one for Nokia as the company announced that it's become profitable again, at least for the period of Q4 2012. Naturally, this makes us think that the company has a chance of stabilizing with Windows Phone as its main mobile operating system. However, even after the good news, most users seem to have remained firmly convinced that the Finns will be better off if they switch to Android, like... right now! This became clear after we ran our poll asking you "Should Nokia switch to Android?". According to the results, the majority of you, which is 59.83% (3631 votes), think that Windows Phone will never be as successful as Android, and so Nokia should make a smart choice and side with the best. However, 35.28% (2141 votes) of you are of the opposite opinion, reasoning that as things have just started to get better for Nokia and Windows Phone, there is no point in abandoning ship now. In our poll we also included a third possible answer, just for the fun of it, which read: "I don't know, maybe they should just license Open WebOS..." Not many of our readers seemed to like the idea, though, so that option was chosen by only 4.89% (297 votes). If one thing is certain in this world, it's that most users wouldn't like Nokia to adopt WebOS. 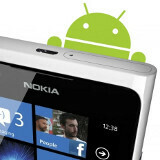 Whether Nokia will eventually decide to open the door for Android remains unknown. For now, the future of the company seems to be bound to Microsoft and Windows Phone. Let's hope it's for the better! Should Nokia switch to Android? Absolutely, Android will always be better than Windows Phone. Nope, things have just started to get better. Why make a switch now? They r doing great with with WP , may be at this time they want to concentrate on WP only.... This is good choice..... They r also making good budget phones.....so stick on this... Why not , in future there will be green robot on Nokia phones.. I heard from a reliable source that the first meeting is actually over for Nokia to jump on to Android. This happened probably two weeks ago... Might take another year for the process to actually move... hoping for the best. Everyone rock Motorola on android too, why's moto still on loss stage? They're NOT doing great with WP. Nokia 5230, a touch screen symbian phone, sold tens of millions units. 5580 xm, more than 20 million. Nokia N8, almost ten million! For the last quarter, Nokia sold a pathetic 4.4 million WP phones. Do the math, can you? Derrrrr 4.4 x 4 = 17.6M...not far from the 20 million 5230s you speak of and that assumes static sales, where we know that Nokia Lumia sales are growing all the time as Nokia release to new markets and carriers. I'm not sure if you are a bit DIM or just 5 years old....but why don't you do the math(s)!! Well, you're comparing here one Symbian model with all available WP models. In 2010, for example, Nokia sold 100 millions of Symbian smartphones. Holly s**t, you got 7 thumbs up for that?!?! My God.. windows phone fans are clearly utter retards.. Actually kid, the Wikipedia states 5230 sold over 100 million units alone..as for symbian, it sold HUNDREDS of millions in total. And now I'm outta here because if I see another reply im afraid my brain will get hurt. Definitely! Arguing with them is like playing chess with pigeons.. Even if they know they're wrong they'll act as if they got it right or will flee by deviating from the topic. Who's deviating from the topic...and what does that quote mean...are you Eric Cantona? Over what period, and in which countries and with which carriers? If Symbian is so good why were Nokia in the sh*t they were in? They clearly didn't have confidence in the platform when compared to the new platforms of the day. Perhaps they did sell 100 million units, but that is when they had very little competition. You're not making a fair comparison. >>Lumia 920 is gradually being launched across the globe and new carriers are just about to launch in the UK. IT'S 2013!!!!! we're two weeks away from WMC! lumia 920 will look like a piece of wood in a month! and it costs OVER 500€ unlocked without a contract! also when you'll be able to apply a wallpaper, then maybe ppl will take wp seriously. I agree with you. I think the WP8 platform is perfect for Nokia. They are the top handset with loads of innovative features and great specs. The build quality is always there with Nokia and they are getting some great press for the Lumia 920. I think they will release a new slicker high end WP8 phone this year and they may not be able to resist the demand for them to make an Android device. Nokia are the pioneers of quality handsets. Forget Apple, they can't hold a light for Nokia for consistent quality. Nokia took their eye off the ball and they have paid a heavy price, but they are back in the game with the Lumia 920 and the only way is up for them now. well. i would like nokia to alternate flagshipd like wp in h1 and android in h2 and so on. Ouch. Where are that Nokia fanb... ah forget it, I think it's good for the Finns to back Win8 as long as strong competition forces Google and Apple to keep improving their OS. The one device I'd love to have though is an Android with the 808 lens. Oppo licensed Sony's Exmor RS, why not go one bigger and do a cameraphone? Don't forget to leave your like (reasonable readers) or dislike (Nokia fanboys) vote.